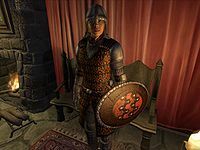 Maelona is a Redguard commoner living in the western corner of Anvil with her husband Gogan. Recently, Gogan saw himself seduced by a gang of local Sirens, infamous for luring married men up to their remote cabin and rob them blind. While Maelona is understandably upset by her husband's deception, she will ask you to play a scam on the Sirens and return a family heirloom from the cabin. 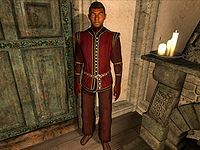 During the related quest, you will find out who is playing a scam on who and the real identities of both Maelona and Gogan. She lives a rather relaxed life in Anvil, especially on rainy days. After waking up at 6am, she spends two hours eating breakfast with Gogan then wanders around in the house until 11am. If the sun is shining, she ventures outside and finds her favorite bench near the Main Gate and sits there until 5pm. If it is raining, she skips the bench altogether and stays in the house. Regardless of weather, Maelona strolls around in the house from 5pm until her bedtime at midnight. She will not speak much outside of the quest, but will show fondness of Anvil: "I like it here. People are very friendly. Much nicer than in the Imperial City." 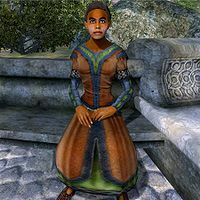 Maelona wears a set of middle class clothing: a russet felt outfit and a pair of quilted shoes. She also carries her house key, a cheese wedge and a medium-sized amount of gold. In Anvil, you may overhear the townsfolk laughing at Gogan for falling for the Sirens' scam, even calling him an idiot; when asked about the gang, they will point you towards the couple for further information: "An all-female gang of thieves has been recently plaguing Anvil with a very unique method of robbing. They pick on only the men. If you want to help us do something about it, go talk to Gogan and Maelona. Let's just say Gogan is intimately involved and leave it at that." Talking to the 'victim', Gogan, will net you a sarcastic reply: "Talk to Maelona. She runs the council. Judge, jury and executioner." and "Talk to her, she seems to have all the answers." Talking to Maelona will prove much more helpful, as she will ask: "How would you like to get my husband, Gogan, out of hot water?" If you say 'no', her response will differ with your gender; if you are male she will hatefully comment: "You men are all alike." If you are female, she will accept: "I don't blame you." When approached again, she will ask: "Back again? You still want to help my good-for-nothing husband?" "Good-for-nothing louse of a husband"
If you accept, she will explain: "Believe me, he'll need all the help he can get to worm his way out of this one. To think he'd fall for the gang's scheme... agh! I could kill him! I'm sorry... I'm rambling and you look confused. Let me explain." After a short break, she will continue: "The women in the gang use their wiles to lure men out to some remote location and rob them blind. It's been going on for some time now. The city guard hasn't done very much about it, because frankly, the men who are robbed are so embarrassed, they don't want to report it. Take for example that good-for-nothing husband of mine, Gogan. He cared more about their charms than my own." If you exit conversation at this point she will express her feelings for Gogan: "Good-for-nothing louse of a husband. He's lucky I still love him." When approached again she will say: "Witches! How dare they prey on our men." Asking her about the gang again will finally hand you the task: "When Gogan was, uh... with the women, they took something quite valuable from him. No... it's not what you're thinking. He was carrying a precious family heirloom with him when he was lured out to their lair. It was a small ring given to him on our wedding day. The ring belonged to my mother, and has been in the family for generations. I'm willing to give you all the money I have to get it back. 100 gold. Can you help us?" If you choose not to, she will make a request: "I understand. Well, if it's all the same to you, please don't tell anyone about Gogan's indiscretion. If you change your mind, please let me know." The next time you talk to her, she will say: "I hope you're here to reconsider." When you finally accept, she will reply: "Thank you. I'm afraid I can't offer you much help, but I'll do what I can." If you exit conversation she will nervously comment: "I hope the reward will suit the risk. It's all I have." When approached again, asking her about the gang will make her elaborate and point you towards Gogan: "All I can tell you is that the best place to start is at The Flowing Bowl. It's a tavern located outside the city walls near the waterfront. Gogan may be able to give you more information beyond that." She will finish the conversation with a warning: "The Flowing Bowl attracts the worst Anvil has to offer. Always be on your guard." If you talk to her again, she will say: "Nothing much more I can help with. I'm afraid you'll have to ask Gogan, my lout of a husband, if you need to know anything else. I'm sure he can provide very highly detailed descriptions of the women." When approached, an embarrassed Gogan will say: "I see my wife couldn't keep her big mouth shut. Yes, it's true. I lost the family ring to those sirens. I'm ashamed about the whole incident, but not ashamed enough to ask for your help." He will then proceed to describe how he was seduced at The Flowing Bowl and will end up with a plea: "Just please, help me get that ring back. I want to save what's left of my marriage." After your encounter with Faustina Cartia and Signy Home-Wrecker, Maelona will ask: "Have any success at The Flowing Bowl?" She will then say: "I knew they would make contact with you. Be careful, there's no telling what they're up to." She will finish conversation with a warning: "They've never hurt anyone yet, but its never too late for them to start." Later on, after you have located Gweden Farm, talking to Maelona will make her say: "So, they're at Gweden, eh? Good to know. Keep on it." and "Gweden isn't far; they're taking quite a risk committing these crimes so close to Anvil." When all is said and done inside Gweden Farm and all three Sirens are dead, Maelona and Gogan will come rushing in, both in full armor, with the Anvil emblem suggesting they have been working undercover; Maelona will be equipped with an Anvil cuirass, chainmail boots, gauntlets, greaves and a guard helmet. She will wield a steel longsword. Additionally, she will carry a set of spare clothing, a pair of burgundy linens, a quilted doublet and quilted shoes. She will then seek you out and reveal the master plan: "We had a feeling you'd be surprised when you saw us in our real uniforms. I see you have a puzzled look on your face. Ask away." When you do, she will explain the scam: "Gogan and I are really members of the Anvil City Watch. I suppose you could say we work undercover. We've been trying to foil Faustina's gang for months now. Every time we tried to interview a man who was lured there, they refused to talk. The women in the gang picked married men to seduce for just that reason. It was decided the only way to stop this gang was to send in a stranger. You fit the bill perfectly. It's a shame it had to end in so much violence, but someone was bound to get hurt sooner or later." When asked about Faustina she will add: "We'll clean up the mess. Don't concern yourself about it. I'm sure you had no choice. If you ever find yourself back in Anvil, stop by anytime and say hello. Oh, and please say nothing to anyone about our true identities. You've done well, and here is the reward that I promised." She will exit the conversation with: "Don't spend all the money from the reward in one place." Approach her again, and she will say: "We have a lot of paperwork and follow-up investigation to do. Please, leave us to it." If you meet her later on in Anvil, she will be pleased: "How nice to see you again." but will reveal nothing about the investigation: "I'm afraid I have very little information to add to our follow-up investigation." When asked about the gang she will conclude: "It appears that you got all of them. We never found evidence of any other members. Nice work!" Finally, she will bid you farewell with an invitation: "You're sharp for an adventurer. If you ever decide to retire, I'm sure the Anvil City Watch would love to have you." By killing the two Sirens when they show up at The Flowing Bowl, it is possible to fail the quest, and destroy Maelona and Gogan's undercover work completely. Gogan will say: "I can't believe you did that. Maelona is furious." As promised, when Maelona lays eyes on you she will angrily say: "I can't believe it." When you talk to her, she will say: "Stupid... just plain stupid." On the subject of 'gang' she will comment: "I can't believe you just went ahead and killed that gang member. Gogan and I were actually working undercover for the Anvil City Guard. Your actions have set back our investigation, and maybe driven the rest of the gang into hiding. Nice work." She will exit conversation with a suggestion: "Next time you want to "help out," just don't." She was also supposed to greet you differently if you had already heard about the Sirens from the townsfolk; however, the "hot water" dialogue takes precedence so this line is never heard: "Oh, you heard about that? We were trying to keep it quiet, but people in this city are far too nosy. Very well, since you said you want to help. I don't suppose you've heard all of the details about the gang of harlots running their little charade here in Anvil have you?"